SWE-ECI is always looking for leaders, volunteers, and participants…explore these questions to determine how you would like to get involved with the section! Are you interested in planning Career Development workshops? Would you like to coordinate a STEM outreach event for K-12 or college students? Are you interested in putting together or hosting a networking or social event? Have you been looking for an opportunity to flex your marketing skills? Would you like experience utilizing social media as a communication and advertising tool? Do you enjoy managing and maintaining websites? 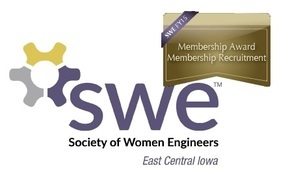 Are you currently a member of a community or professional organization that would like to strengthen connections or combine efforts to partner with SWE? Are you an alumnus of the University of Iowa, and looking for a way to give back to the university and support college women in engineering? Are you looking for leadership experience outside of your role at work? If you answered yes to any of the above questions – contact SWE-ECI about becoming a leader! Would you like to occasionally assist with planning or finding resources for an event? Would you like to volunteer your time to participate in STEM outreach without having to plan or coordinate an event? Are you well connected, and interested volunteering as a resource to better connect SWE within the community? If you answered yes to any of the above questions, or have more ideas on how you would like to volunteer – please contact the SWE-ECI Outreach Chair! Are interested in learning more about and attending section events? If you answered yes to the above questions –join our email list today to stay informed! To find more information and apply for membership in the Society of Women Engineers, visit the Society website.